What was I doing ? - Cornwall Yarn Shop, Ltd. If only I had written things down ! Well - CYS to the rescue. First, NEVER write on an original pattern. Patterns cost money and may be used again. I always make a copy and write (mostly legibly) on that. Now, I always make a swatch and hopefully use purl stitches or YO's to record my needle size within the swatch. My projects travel ALL over - the house, the shop and NYS. Things somehow get separated and I lose some vital info - sometimes even my pattern. (So maybe I'm not just a lazy knitter, but an unorganized knitter). I developed a simple Project ID card where vital info may be recorded and attached to one's project, project bag or pattern. There is even a place to record a VERY important piece of information that one frequently needs, frequently doesn't know, and may not even know how to figure it out ! Do I have enough yarn to finish this row; complete another repeat; bind off; place my join ????? Decide if you need to know the length of yarn in inches, feet or yards. Measure regular intervals from the base of the needle; in this instance I used 1 foot. Then knit the required number of stitches or rows, removing the waste yarn as you knit. Then count them to determine the amount of yarn needed. 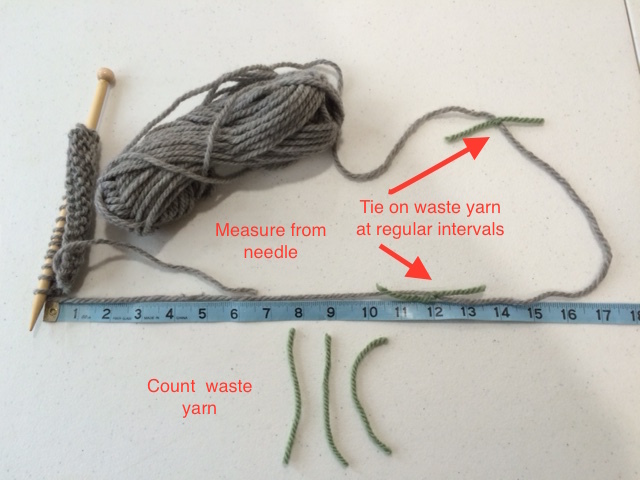 Another reason waste yarn is the best notion to carry in your knitting bag !